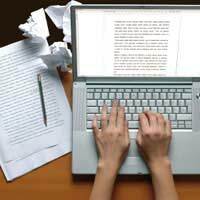 The main body of your essay is arguably the easiest part to write. This section is far more straight forward than the introduction or conclusion, which can induce chronic writers block. The purpose of the main body of your essay is to deliver your points clearly and persuasively, backing them up with reliable evidence. With a little careful planning, your essay should prove relatively easy and even enjoyable to write. It has been suggested that the main body of an essay should include five main points. There is no need to stick rigidly to this number but for a medium length essay, it can be useful figure to work with. Remember that you will be making additional explanatory points when you elaborate on your main arguments. The most important thing to do is to think in advance about the key points you want to make and take the time to plan each one. Each key point should be made up of three ingredients; the point, an example and an explanation. And your explanation could read: “Here, Hamlet is shown to be preoccupied with the idea of death. He leads an introspective life which is at odds with the mindset of those within the court. In this way, the philosophic, alienated and morbid Hamlet is contrasted with the practical and prosaic Polonius. In this example, the quote from the play acts as the evidence. When writing an essay on another subject, you might choose a statistic, a historical occurrence or an interesting fact instead. As you can see, the main point has been made, an example has been given in order to back it up and the relevancy of the example to the point has been made explicit. This three step formula is a very effective plan to follow in each essay you write. You might like to think of the word 'PEGEX' to help you remember it. Think too about the structure of your essay. Consider which would be the most effective way in which to order your points to strengthen and further your argument. Experiment with ordering your key points in different ways. You might even plan each point on an individual piece of paper and practice reshuffling them to gain an impression of the different possible ways that you could write your essay. Each point and paragraph should link together and there should be a sense of fluidity. Keeping a list of useful joining words and phrases to hand that can help you to ensure your points relate well to each other. Your list might include words such as: moreover, however, furthermore, similarly and surely. You might employ phrases such as: in fact, on the whole, in contrast and on the other hand. These are the words and phrases of argument, comparison and contrast and will help you to ensure that you essay is focused and persuasive. Although this mode of planning and writing the main body of your essay may appear rigid and prescriptive, it is an excellent framework to work with. Using this structure, you can simply fit your individual points into the correct places and experiment with your argument until you feel that it is right. Having this method in your mind will give you confidence when you begin any essay and, as such, can be particularly useful in exam situations, as well as when completing essays that have been set for homework.